Successfully Added LED Smiley Emoticon Sign - Roadway Fun to your Shopping Cart. LED smiley sign for installing in vehicles. 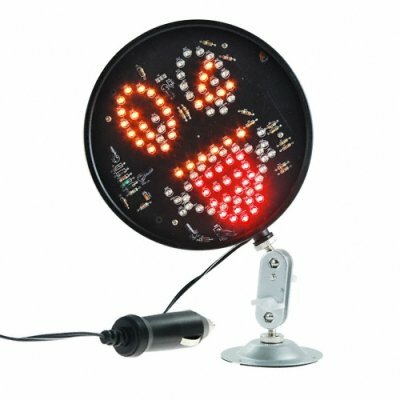 Powered by the cigarette lighter socket of your car, this LED sign lights up into three different classic smiley emoticons. Give the driver next to you a warm smile, a wink with a tongue, or a frowny face, the choice is yours. Make new friends (or enemies) with this fun LED sign! The CVSDU-10000 is an excellent wholesale item suitable for high margin sales; order with confidence from the original direct from China electronics wholesaler, Chinavasion. LED smiley sign for your vehicle. Share your feelings with other drivers. Flirt with the girl (or boy) in the car next to you.